I tested the DX4000 using our standard NAS test process. Since it came configured in RAID 5 and there isn't an easy way to mess with that, I ran tests only in that mode. So you'll only find the DX4000 in the NAS Charts by using the RAID 5 benchmarks. The Benchmark summary below shows Windows RAID 5 File copy write and read in the low-to-mid 70 MB/s range. NASPT RAID 5 write was a bit higher at 80 MB/s, but read was significantly lower at 68 MB/s. 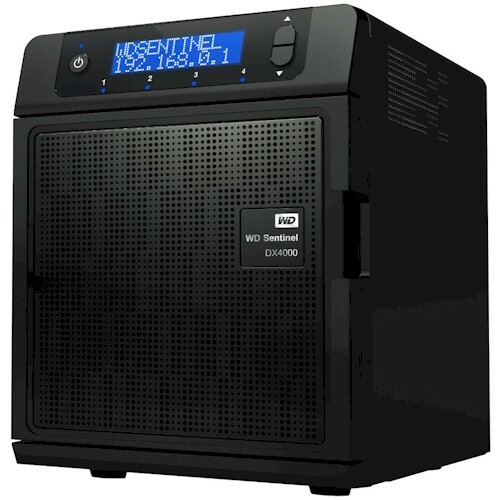 WSS' backup utility can be used to back up only the entire system. So I checked backup speed to an WD MyBook 3.0 formatted in NTFS using my standard robocopy routine to copy the 4.35 GB ripped-DVD test folder. As the summary above shows, this came in at 60 MB/s. I didn't check network backup because the WSS backup utility works only with another WSS system, which I don't have. I couldn't test the DX4000's iSCSI performance, because it doesn't support being used as an iSCSI target. The RAID 5 File Copy Write and Read charts below are filtered to show only four-bay NASes. The DX4000 lags significantly behind the D525-powered Thecus N4200PRO, but also behind products with lower-powered CPUs like the D510 Atom-based Synology DS411+. RAID 5 read sees the DX4000 slipping even lower still, and outperformed by even Marvell Kirkwood powered products like the QNAP TS-419P+. If you're looking for the fastest D525 Atom NAS, the WD DX4000 won't be your choice. But there are other aspects to NASes than performance, which Craig covers in his complete review. You can also use the NAS Finder and NAS Charts to compare it with other products.